Today I tweeted to The Zoe Report not expecting a response and right away I received the reply that is above. Even though this tweet was most likely not from the AMAZING Rachel herself, it’s still nice to know that her team took the time to write back to lil’ ‘ol me. I have deeply admired Rachel Zoe since her show (The Rachel Zoe Project) debuted on Bravo in 2008. When the show began I was instantly hooked and knew at that moment that I wanted to follow in Rachel’s footsteps. Since then my dreams haven’t wavered and I am taking a similar path that Rachel herself took. Some GREAT advice I received from Damsel in Dior as well as the ladies at E! is that, “there is no wrong or right path to take, all that matters is that you got there.” I believe this bit of advice pertains not only to me, but to many of you other fashionistas trying to break into the bizz. 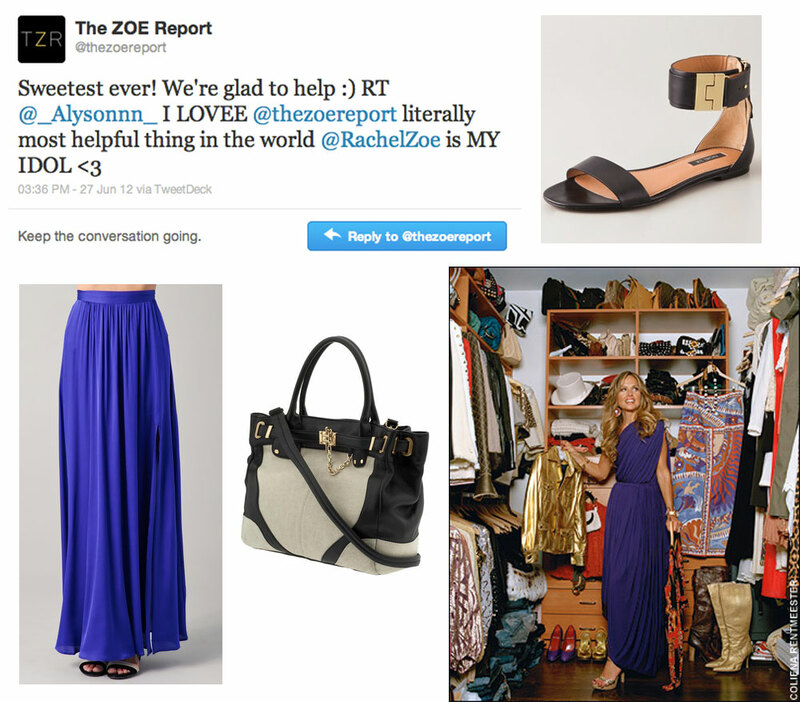 Now not only has Rachel Zoe had a popular television show, she also is a critic on Piperlime, stylist to the stars, has her own line and of course has the hugely successful fashion advice site TheZoeReport.com. The items pictured are all pieces by Zoe: Gladys Flat Sandals $235, Venessa Maxi Skirt $346.50 (on sale), Zoe Mini $331.99 (on sale).